This weekend I was on a mission to make a franken dupe of China Glaze No Way Jose (photo courtesy of lextard). This is a discontinued polish. You cannot find this anywhere. It's not on ebay it's not on etailers. It is gone. The problem is I *need* this polish. I decided I would try to franken this. My franken attempt was a fail. I don't even recall the recipe at this point. I think I worked on this for 3 hours over the span of 2 days. The bottle overflowed about 5 times. I used probably 7 different polishes. 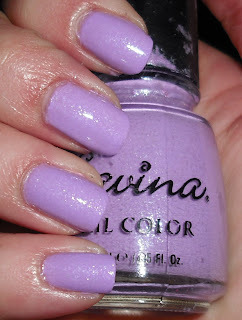 I never came up with a dupe of this amazing color. That being said I'm kind of in love with my franken, but I still need that No Way Jose! Snow-Kissed Lilac is a bright lilac pastel creme mixed in with white/clear glass fleck glitter (I used Orly Winter Wonderland for this). I want to to thank "popojijo" on MUA for helping me name this. While it's no NWJ, it's still pretty! And that name is perfect for the color. No Way Jose is pretty, but I like yours better and the name is perfect. Why would they discontinue that color!? It is so beautiful! You know ICING has a color that could potentially make a good base for a franken. It's called Preppy Purple. There are pics on my blog if you'd like to see it. I can see why u need that color. I'm not familiar with no way jose. I'll research it. Your frankening is beautiful. Where can we get Savina's in Orlando? Let them have Polish- I don't know why they discontinued it. :( I'll have a look at that color on your blog thanks for the recommendation. Scandalous- I haven't found all those others you mentioned! I'm so bad at HTF shopping. I hope No Way Jose can be found again! rmcandlelight- I get Savinas at Nordstrom Rack in the same area as Millenia Mall and IKEA. from one of my favorite shades. i love this! no way jose was great.